FLCL is a pretty legendary anime to many who have seen it. Some have called it a masterpiece and explained why it’s one of the best anime out there. I can only imagine what anime they must have seen before this one (Fruits Basket? Nah, even that one’s better than this!) because FLCL is officially the worst anime that I have ever seen. I dare say that it’s the worst animated show that I’ve seen and that’s saying something. This show tried to be a lot like Serial Experiments Lain. 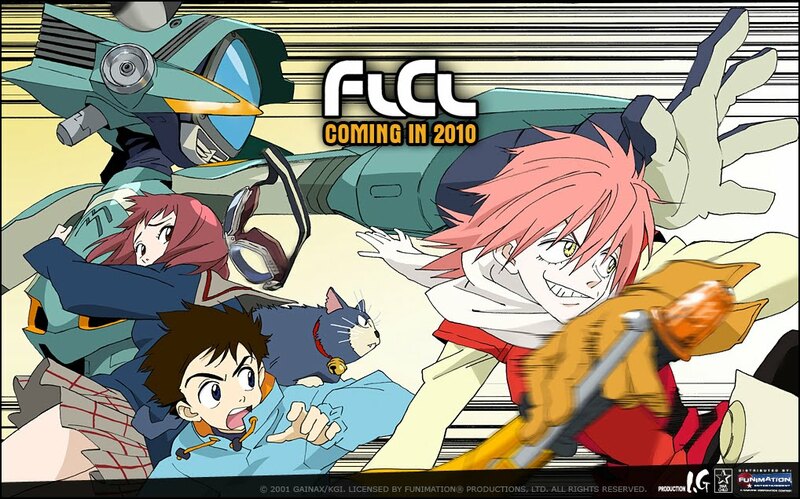 While I did not care for that show too much, it was leagues better than FLCL. Lain may have had some weird moments and scenes that were filler, but some of the conspiracy theories were fun to watch and the fact that aliens started to appear made things even cooler. FLCL is also a very strange show, but there is no payoff and most of the “strangeness” is just used for fanservice. You can’t go a minute in the show without something wince worthy happening. Takun is the main character and he’s one of the worst main characters that you will ever see in any media. He’s the type of guy that ends up falling for just about anyone and he has absolutely no will power. He can’t seem to make up his mind and he’s constantly whining about something. Anyway, he is run over by a motorcycle one day. The person who ran him over is an alien (Sure, why not) named Haruko and now robots are able to transport through Takun’s head by way of a portal. Takun is the only head that seems to be naturally able to do this although others can be forced like Mamimi and Eri. Takun decides that he will help the fugitive Haruko to defy the law and try to incinerate the planet by finding the Pirate King. As you can see, Takun is a very unlikable character and he definitely seemed ready to betray Earth in a heartbeat. I don’t even need to go into the other characters because they are all very awful. Haruko is just there to lead on all of the other characters and his friends are all very sad as well. The show suffers from hundreds of problems, but there are several big ones that should be noted. The first is that the music score is horrendous pretty uninspired. There are no themes that stand out and they constantly keep on reusing the same old themes over and over again. Considering that this show is less than 10 episodes, it’s sad that the themes drag out so much. Another one of the show’s problems is the fact that it does drag out. The series is only around 6 episodes and yet it will feel like you’re watching a 3 hour movie each episode. It’s not that they cover a lot in each episode…far from it! Each episode is essentially filler and nothing happens in the entire series. Each episodes drags on and on and you’ll constantly be looking at the clock to try and gauge how much time is left. None of the jokes in the show are funny and the characters are all so bad. I already mentioned the characters earlier, but that is one of the critical negatives of the show. Just about every single character in this anime is perverted and they are all very bad characters. I should probably give more of them losses on the blog in the future. The animation is also pretty awful. The show was going for a cinematic look, but that’s not a very good thing in the first place. Standard animation is still the best, although you still have the rare cinematic animation that really works. (DBZ Hatchiyack, Transformers G1) The show tries to disguise the terrible animation by making things go crazy, but it just makes the show look worse. The show came out in 2000, but I could name shows from the 70’s and maybe earlier that had far superior animation. There are dozens and dozens of other problems with the show, but we don’t want to be here for the next 10 years. Either way, you get the drift. This is a show that you should stay far away from. It has terrible characters, terrible animation, terrible plot, terrible setting, terrible pacing, terrible episode count, terrible soundtrack, terrible character designs, terrible voice acting, terrible…..etc. I didn’t mention any good things did I? There was the final fight in the final episode, but it was only about a minute long and it ended with a total cop out, plus it was a fight between two extremely awful characters and the power levels were very inconsistent so it just ended up adding more errors to an already loaded show so I figured that I probably shouldn’t add this as it would only make the situation worse for the show and we wouldn’t want that. That’s probably for the best since there weren’t any real good things about the show. Overall, you do not want to check this show out. Do not believe the reviews and just remember how awful it is. The amount of fan service and perverted characters should be an instant warning sign for you. This is definitely the worst anime that I have ever seen and it’ll probably stay that way. (I hope so, for my sake!) If you want to watch something strange, then check out Serial Experiments Lain, although I can only half recommend that. Otherwise, seriously..just watch any other show. It’s bound to be better than this and FLCL is something that will hopefully die into obscurity. (After I finish drop kicking the characters on the blog) In the end, I don’t get how anyone could like this show. To each their own, but do yourself a favor and don’t watch this. This is something that you will want to forget. This show offends your eyes!!! This entry was posted in 0 Star TV Shows, TV Show Reviews, TV Shows by dreager1. Bookmark the permalink. You missed the plot entirely, the characters entirely and show overall entirely. Please Understand…..this show was terrible.